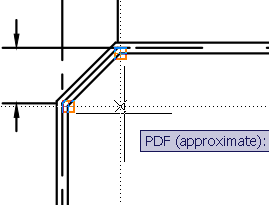 When you have attached a PDF Underlay you can access it again in many ways. DWF – A DWF (Design Web Format) file is a highly compressed file format that is created from a DWG file. DWFx – DWFx, the future of DWF, is based on the XML Paper Specification (XPS) format from Microsoft. PDF – Adobe System’s document exchange format. DGN – Bentley System’s Microstation format. DGN support is limited to V7/V8 DGN files and 2D objects. The 2D objects are imported or attached with full (X, Y, Z) coordinate information, as was present in the original file. If the file contains 3D solids, surfaces, or other 3D objects, a warning is displayed. This content is not supported in this file. So if you do use Underlay – what options are there? You can reattach an underlay multiple times, treating them as a block. Each underlay has its own clip boundary and settings for contrast, fade, and monochrome. Warning: You cannot bind an underlay to a drawing and you cannot edit or modify the underlay’s content. DWG file references (xrefs), in a drawing can include an underlay. In this situation, objects in the underlay are visible in the parent DWG file. For example, drawing A includes a DWF underlay showing some mechanical details. You need the content of drawing A attached to your current drawing, drawing B. If you attach drawing A as an external reference to drawing B, the DWF underlay that was already attached to drawing A is also be present. All of the property settings made to the underlay in the external reference, such as clipping boundaries, appear as they do in the parent drawing. If a file you want to attach as an underlay is password protected, you are prompted to enter the password after you have selected the file. You cannot attach the file until you have correctly entered the password. After an underlay is attached to a DWG file, you are prompted for the underlay file’s password each time you open the DWG file. If the DWG file is also password protected, or has several other protected drawing references attached, you may be prompted for multiple passwords. If you change the path of an underlay to a file that requires a password, you are prompted for a password as well. Note: DWF, DWFx, and PDF file passwords are case sensitive but DWG file passwords are not. To make synchronization between DWG and DWF file passwords easier, make sure the DWF, DWFx, and PDF file passwords match the DWG file password and are entirely uppercase. Or better yet – don’t use passwords. 1 Comment To "Underlay in AutoCAD 2010"
I wonder why the osnap will not work while using DWF underlay in AutoCAD 2010. DWF file was scaled when attach to a dwg file.